etouches & BizBash Release White Paper Focused on Event R.O.I. 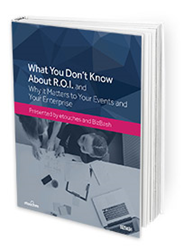 etouches & BizBash White Paper: What You Don't Know About R.O.I. Out of 400 event professionals surveyed, only 11% said they measure event R.O.I. well. etouches, a top provider of cloud event management software solutions, today announced the release of a new white paper that focuses on understanding event R.O.I. and how it impacts your organization. Created in conjunction with BizBash, the leading resource for event and meeting professionals, the white paper was developed to help event organizers create a strategic plan that will allow them to determine their true event R.O.I. by better understanding the processes involved. etouches is a global end-to-end event management software solution. The success oriented and cloud-based platform delivers innovative technology solutions to streamline the event process and increase R.O.I. Founded in 2008, etouches has assisted over 20,000 event professionals in planning, executing and measuring their events. With a focus on event sourcing, registration, marketing, logistics, engagement and data, the software solution has been able to serve more than 1,000 customers in corporations, associations, agencies and educational institutions. Headquartered in the United States in Norwalk, CT, the company has four additional global offices in the United Kingdom, Belgium, Australia and the UAE. Learn more about etouches at http://www.etouches.com. BizBash is North America’s leading event marketplace for content ideas, news, and industry resources. Each month more than 200,000 unique users look to BizBash for venue discovery, event style, and tools for their next event. Visit us at http://www.bizbash.com, and follow us at @BizBash and http://www.facebook.com/bizbash.